Edwin Farnham Butler III, far better known as Win Butler, is the founder of the riot of darkness and beauty that is Arcade Fire. He's a tall drink of water from Texas who fled the dull flatlands for the glamour and weirdness of Montréal. He grew up in The Woodlands, a planned community about a half-hour north of Houston, Texas, halfway between Humble and Cut-and-Shoot (yes, real towns). His upbringing was Morman; his Dad worked for Halliburton. It was the Eighties and the oil boom had busted. But Win Butler carried that world forward with him, growing up to create music exploring the intricacies of suburban hopes and dreams, and doing far better than most who’ve tried. Butler's co-founder and partner in rhyme is his wife, Régine Chassagne. She was also the survivor of a suburban childhood, albeit one a lot chillier. Her parents had settled in Montréal upon fleeing Haiti (a country that she and the band support avidly as activists and philanthropists). Besides writing and singing, Chassagne contributes accordion, drums, xylophone, hurdy-gurdy, keyboards and organ to Arcade Fire. Butler ended up at McGill University in Montréal. They met and married in 2003, and had one son ten years later. In between and since, the couple has thrown themselves into articulating the pain and joy of just what happens to those hopes and dreams. 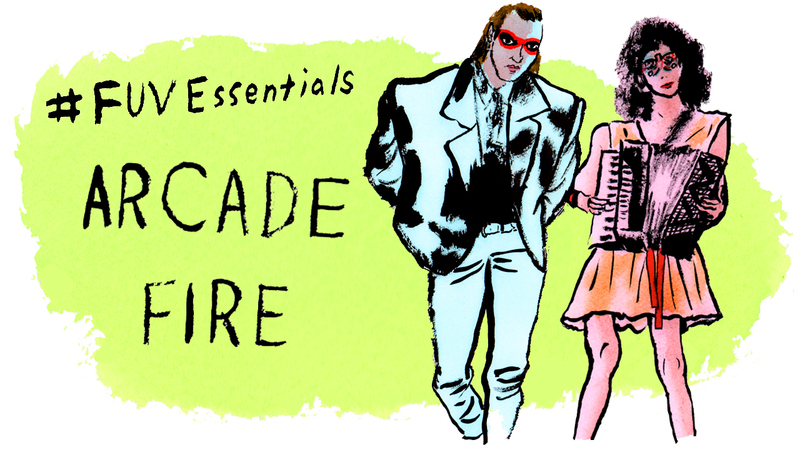 Though the lineup of Arcade Fire has fluctuated enough to make one lose track (one of the band's three co-founders, Josh Deu, Butler's former high school and McGill classmate, left Arcade Fire in 2003), the core of the band has evolved to include solid, kindred spirits. Win’s brother Will Butler, who brings comic relief to the stage, offers synthesizer, bass, guitar and percussion. Then there’s Richard Reed Parry (guitar, double bass, drums, celesta, keyboards, and accordion), Tim Kingsbury (bass guitar, guitar, and occasionally keyboards), and Jeremy Gara (drums and occasionally guitar). Owen Pallett (violin, viola, vocals, piano, harpsichord, synthesizer, guitar, bass) is a former member and regular contributor to the band. It’s a collection of natural musicians: it’s in their blood and they switch instruments with ease. How do you describe the music of Arcade Fire? Imagine a contained space, like a big, clear box. Now fill that box to every edge with loud rock percussion — drums and lots of cymbals, bouncing off the walls and ceiling. Then squeeze keyboard and string melodies into the spaces between the beats, even if they leak out a little. Then stick your face in and scream and scream your broken heart out into it. Arcade Fire was born of refugees from normal places who fled toward art. Their first work came out of Montréal, they were kids, young, buried in snow, housebound, and cabin fever crazy. Their first eponymous EP came out of that energy. While they dug in and worked, they started losing loved ones, with the passing of Chassagne's grandmother, the Butler brothers' grandfather, and Parry's aunt, in quick succession. As they tenderly observe in their song "In the Backseat," from their brutal smash of a debut album, Funeral: “My family tree's/Losing all its leaves." Released in September 2004, Funeral was a chronicle of becoming an adult, and not being terribly happy about it. Somethin’ filled up my heart with nothin’. But now that I’m older, my heart’s colder, and I can see that it’s a lie. But these angry, selfish, rebellious kids became artists in the process, and people took notice. David Bowie became an immediate and true fan (and later collaborator). They earned a Grammy nomination and toured with U2. They ran the festival circuit: Lollapalooza, Coachella, bam. They bought a church and turned it into a recording studio. There they dug in and recorded and recorded. It all got leaked online, but officially came out as Neon Bible in March 2007. By the time Arcade Fire scored their first "Saturday Night Live" appearance, fans had already heard “Intervention,” “Black Mirror,” and “Keep the Car Running.” These new songs were dark, still. Very. But not so self-focused. Arcade Fire had looked up and out at the world and found their lives echoed around them. Neon Bible described the powerful shared nightmares and fears, the curses and dread. It was them against the world. The “kids” toured like mad, hundreds of dates, played 33 festivals. The tour became a film, "Miroir Noir." They played fundraisers for President Obama and one with Jay-Z, even. You started hearing their songs in movies, TV shows, and commercials. Every spark of friendship and love will die without a home. And it's rising still And I don't wanna see it at my windowsill. In August 2010 Arcade Fire released The Suburbs. What better way to celebrate than by broadcasting their Madison Square Garden concert live via YouTube, directed by Terry Gilliam? This masterful chronicle of cul-de-sacs and brokenness debuted at #1 on album charts in the US, UK and Canada. There was an awesome interactive music video, more "Saturday Night Live" appearances, the "Hunger Games" score and soundtrack — and still mainstream America was blown away when Arcade Fire won the 2011 Grammy Award for Album of the Year. Arcade Who? It was a natural fit for the band to work with LCD Soundsystem's James Murphy on their next project, 2013's Reflektor. That album is still them, but less goth, and more danceable. The added attention of the Grammy win put even more of a spotlight on the process, but they kept their true cool — street art, with the word “Reflektor” in it, and cryptic “9pm 9/9” mentions in social media, hinted at the upcoming release. There were Bowie vocals, mandatory “please wear formal attire or costume" dress codes, and an NBC half-hour concert special: all the work of artists who have the courage of their creativity. Arcade Fire was everywhere: live award show videos, more innovative and acclaimed film scoring work, Juno Awards, Polaris Prizes, and documentary on the making of Reflektor. and now we're staring at a screen. Now, millions of people are waiting to see what they do next. There is a plan out there — tour dates have been announced and a new album is around the bend. In January 2017, a new concert DVD and concert, "The Reflektor Tapes," was released. They’ve since followed the art muse south to live in barmy and balmy New Orleans, which makes perfect sense. Arcade Fire recorded the audience at their Voodoo Music + Arts Experience set in their new hometown last October, saying it’d be on their next record. Rumors say spring of 2017. Will Butler said (on Reddit, natch) that “It'll be done when it's done.” In the meantime, we have their Trump Inauguration Day release with Mavis Staples on vocals and a message for our elected officials: "I Give You Power" (and I can take it away); all proceeds go to the ACLU. And a reminder of another organization that Arcade Fire helms: Chassagne is the co-founder of KANPE, a charity for Haiti that works with Partners in Health, a nonprofit organization that helps provide health care to poverty-stricken areas of the world. Since 2006, Arcade Fire has donated $1, £1, or €1 of each concert ticket they’ve sold to the organization. For being gut-honest, insanely talented, incorruptible and intensely interesting, we hereby dub Arcade Fire one of our FUV Essentials.